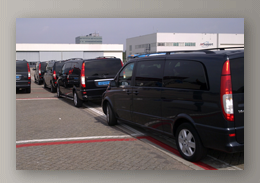 The Holland Limousine Services fleet consists only of the most modern, state of the art limousines, saloons and VIP-vans. Such as the Mercedes Benz E-, and S-class saloons, E- and E-class stretched limousines, as well as Cadillac Ultra-Stretched Limousines. Even for large groups, we have a variety of vehicles to offer. Thanks to an expert, in-house, maintenance department, all of our vehicles are kept in perfect condition. That way you can be sure that you're travelling in a safe, and well maintained saloon or limousine.